After an another unsuccessful hunt in the treacherous Mountains of the Spine, the young Eragon is forced to return to Carvahall, empty-handed. Unfortunately for Eragon this means his family will have to go hungry, as the meat from each of his hunting expeditions was the only thing keeping the family from going hungry and starving during the winter. However by some miracle Eragon happens to stumbles into a small clearing on his decent. Resting in the middle of which is an oblong blue stone, the likes of which he’s never seen before. Maybe everything wasn’t so bad after all. Surely someone was willing to trade with him for such a beautiful object. With renewed vigour Eragon returns to Carvahall, content with the fact that the strange stone could be traded for meat in the local butcher. Upon his arrival, Eragon finds himself and his stone subject to scrutiny from the village Butcher, because of the many legends and stories associated with the Spine. The Butcher, like the majority of the Carvahall will not have anything to do with the cursed Spine, even indirectly. Luckily the village blacksmith, Horst solves Eragon’s food problem, trading Eragon’s labour for meat. Despite the rock’s obvious beauty, Eragon’s Uncle wants nothing to do with it, apart from trading it for sustenance, as hard as that could end up being. Stranger still, the rock seems harder than any stone or even metal, Eragon’s see or heard of before! Certainly a sign of how valuable an artefact it truly was. That very night Eragon wakes startled to find the precious rock broken in pieces on his very bedroom floor. And a…dragon sitting in the centre of the destruction! Maybe it wasn’t a rock after all, maybe it was an egg. A dragon egg! As awesome as that would be how was Eragon supposed to care for such a creature, when the family already struggled to survive as it was? Could this dragon be the same dragons from the tales of old? The tales which talked of a Dragons and their Riders. Surely they were mere stories and fanciful tales conjured up in the mind of the village story-teller, Brom? And if there was more to them than mere stories, did that make Eragon a…Dragon Rider!? Eragon’s fears are confirmed with the arrival of two contorted and hooded strangers in Carvahall, both asking about the rock’s or more accurately egg’s whereabouts. Before long it’s clear that the dark strangers are not entirely human. Upon further questioning Brom and his stories, Eragon finds that these creatures are as he feared. according to Brom the creatures are most likely the legendary Ra’zac, ancient servants of the tyrant and King, Galbatorix. After rising tensions between the villagers and the hooded ‘men’, Eragon goes into hiding, fearing for his dragon’s very life. When he return he finds his Uncle Garrow, dead, lying in the ruins of his humble farm. 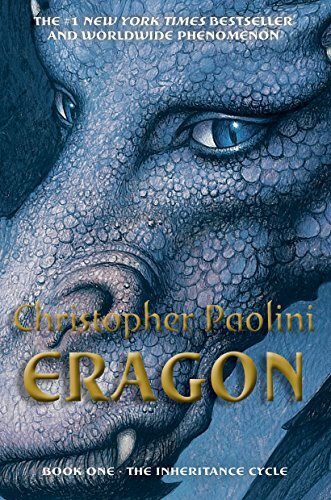 With the aid of the storyteller Brom, Eragon sets out on a journey to avenge his Uncle’s death and bring his killer’s to justice. One which he may never return from if Brom’s stories of the Ra’zac are to be believed. Either way Eragon must try, after all it was his fault Garrow was dead, wasn’t it? TEEN OVERVIEW: A simply astounding piece of work from Paolini, the sheer dept of his world putting the majority of the fantasy genre to shame. Eragon had me totally and absolutely glued to the pages, from the very beginning.